Unfortunately, the Husky HDR310 Air Compressor is no longer available. You can explore other items in the Air Compressor category yourself to try and find the perfect replacement for you! 12-Volt inflator with safety light designed for your car. Auto shut-off gauge turns pump off at pre-set pressure. Fast inflation of car tires, bike tires and sports balls. 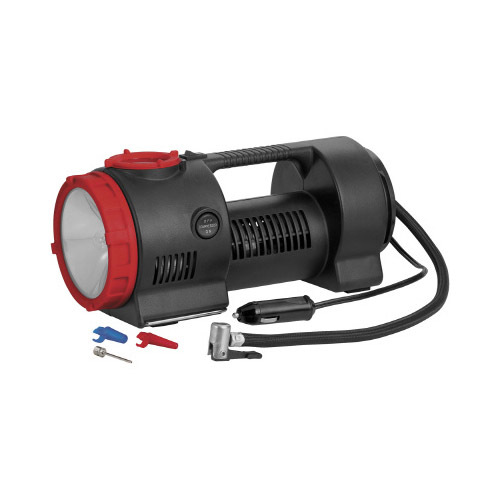 The bright light is an essential for work and roadside emergencies. Features a bright work and flashing safety light for night-time emergencies and road side assistance. A wire stand raises the light off the ground. The inflator has a built-in pressure gauge and three inflation accessories. Weight: 4 lbs Dimensions: 10.9" x 4.6" x 6.3"